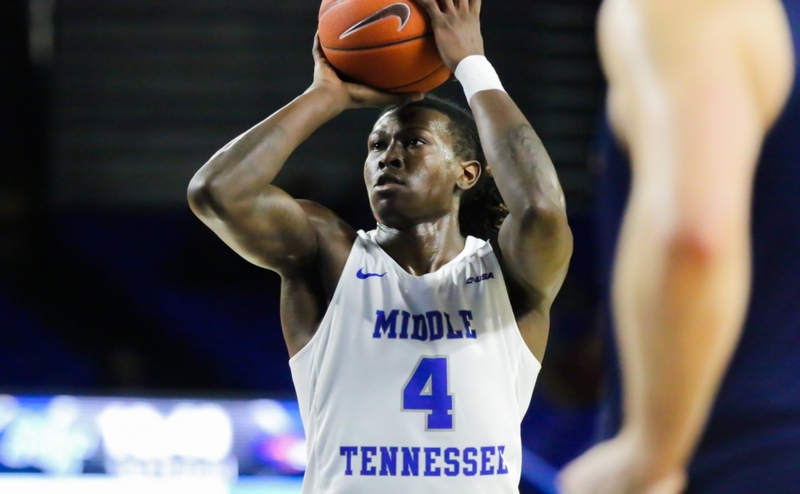 Middle Tennessee (11-3, 1-0 C-USA) is off and running in conference play after beating UAB (7-7, 0-1 C-USA) 60-49 on Sunday night in the Murphy Center. Reggie Upshaw was the story of the night as the forward displayed his all-around game en route to a career-high 34-point performance. 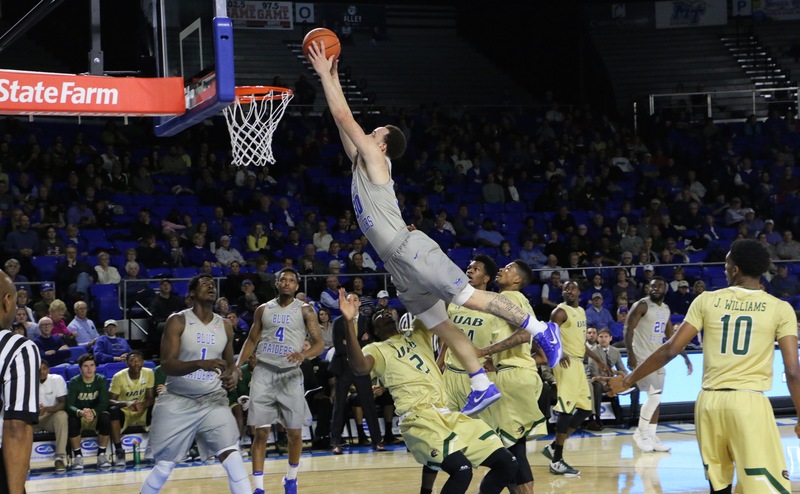 The win for the Blue Raiders was their first over UAB since March 6, 2015. 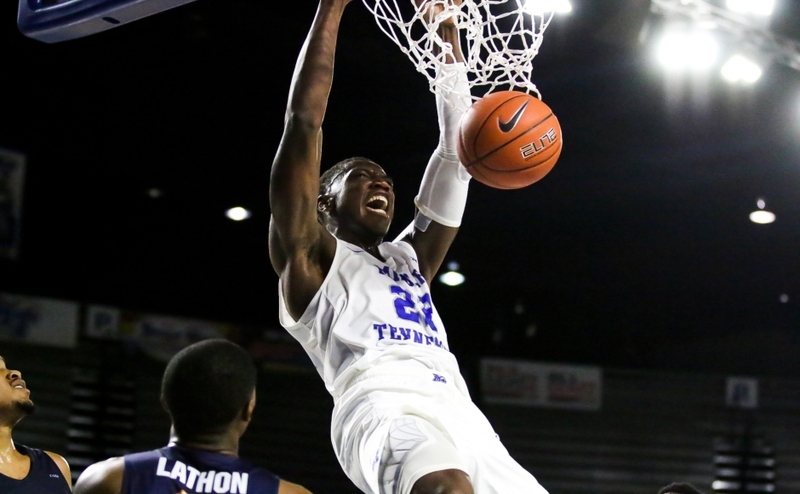 Right out the gates, the Blue Raiders got off to a 10-1 start behind the play of Upshaw. The Blazers started applying pressure that allowed them to come back quickly and make things interesting. But just moments later, Upshaw accounted for one of highlights of the year as he drove in the lane and soared over 6-foot-9, 244 pound Tosin Mehinti, getting the slam and the and-1 call. The play not only got the team scoring again, but it also ignited a crowd of 4,227 on hand. MTSU would later taper off, going 2-of-9 from the floor midway through the half that led to to a drought of 2:48 minutes. An Upshaw three from the top of the key, followed by a tip in the following possession stretched the MTSU lead to 26-15. Lead by Upshaw with 16 points, the Blue Raiders went on a 13-2 run over a span of six minutes to to close out the half. A Giddy Potts three at the buzzer would give the Blue Raiders a 33-20 lead at the break, a margin they would maintain for the remainder of the night. 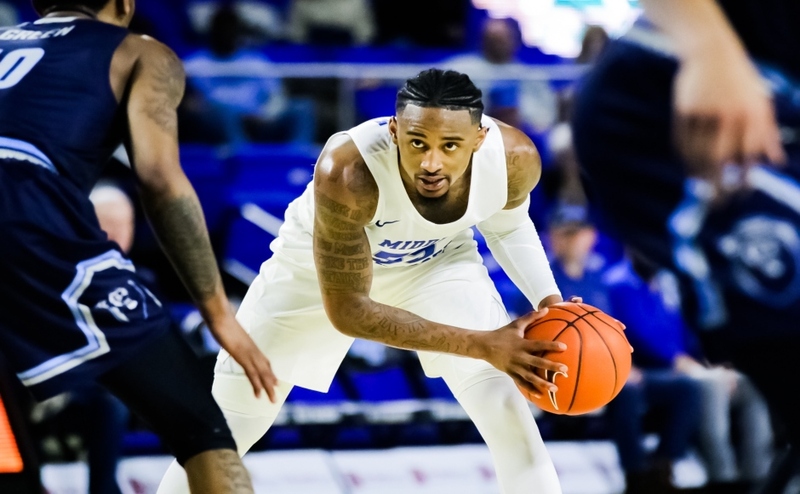 It was a slow start to the final 20 minutes by both squads until Ed Simpson found Xavier Habersham alone in the corner for a three to keep the Blue Raiders at a steady 13-point advantage. 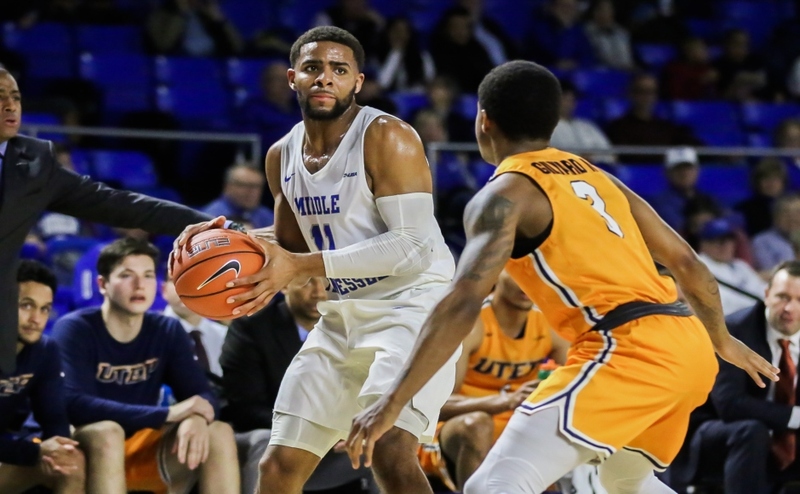 MTSU completely shut down the Blazers late as they accounted for just one field goal in the final eight minutes of the game, as the Raiders would cruise to the big victory over the reigning 2016 regular season C-USA champs. UAB was held to just 15-of-34 from the field (34.9%), and 3-of-9 from three (33%). They also gave up 16 turnovers that lead to 14 MTSU points. UAB’s 49 points scored on Sunday were the lowest output since Nov. 27, 2014 when they logged just 47 against No. 16 Florida. On the night, Upshaw produced scores from inside, outside, and mid-range. The senior forward scored at will, but also came up with big stops on the defensive end and was just one rebound shy of a double-double. The Chattanooga native finished 11-of-16 from the field (68%), 4-of-8 from deep (50%), and 8-of-11 from the line (72%). Upshaw said during the game that he didn’t realize the career night he was putting together. Lee finished seven points while William left with just five. Upshaw’s previous career-high of 32 was set against Trevecca on Dec. 30, 2015. “He got in a good rhythm,” said head coach Kermit Davis who is now 4-8 against UAB. “He shot the ball good in practice. We’ve challenged Reggie, I’ve challenged Reggie in a good way and I thought he responded well today. JaCorey Williams also scored 10 points and hauled in seven boards on the evening. Giddy Potts was in foul trouble for most of the game, fouling out midway through the second half. He was held to just six points. MTSU now has a few days off before heading to Texas for the weekend to compete against Rice on Thursday and North Texas on Saturday. Tip-off times are set for 7 p.m. and 2 p.m., respectively.